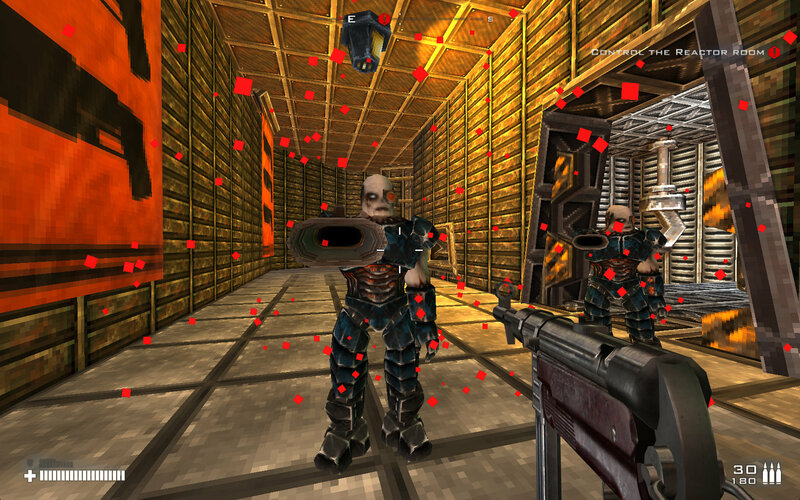 Bedlam's concept is certainly interesting: take a trip through FPS games from different eras. But does it work? Today is not a good one for Bedlam's protagonist, foul-mouthed Scot, Heather Quinn. She's just woken up inside an old video game called Starfire, something that she used to play when she was younger. Not only that, but she soon discovers that she's one of the game's villains – an ugly, chunky cyborg. What's going on? Your mission is to find out. Written by author Christopher Brookmyre, and based on his eponymous book, Bedlam's concept is pretty damn awesome. It's basically an homage to classic titles of the 80's, 90's and 00's, and features a variety of different minigames-within-a-game. A clever concept for sure, even though, unfortunately, its execution leaves a lot to be desired. The action starts as Heather wakes up – inside what looks like a typically blocky 90's style FPS whose color and art style is highly reminiscent of DOOM and Quake. Almost immediately, the rather excellent dialog begins – irreverent, self-referential banter between the game's protagonist and the overlord of Starfire's enemies. He's not particularly helpful, but does at least send Heather on a mission that is her first step to figuring out how to escape from this nightmare. The first level plays out like a version of DOOM, and you run around a fairly linear environment popping off shots at enemies with a peashooter of a pistol. Fortunately, the enemies aren't that tough, and, after a couple of shots, go down in a pile of pixilated blood spurts and boxy body parts. As the game progresses, there are additional weapons to pick up to help you along the way – very useful for when you encounter the first boss character, who is quite challenging. At least, he is until you figure out you can just circle-strafe behind him with a rail-gun and blow him to pieces without him being able to touch you. Hurrah for glitchy, old-school boss AI! During the DOOM-style levels, I came across a portal that led to a low gravity Deathmatch mini-game where I played against five other "players" and had to be the first to score 15 frags so that I could win and escape. This sub-level was really funny, with each player having their own pre-pubescent dialog, most of which seemed to be them whining about lag when I killed them, or boasting massively when they managed to shoot me. It was highly enjoyable, and was without doubt the most fun I had in this game. The biggest problem with Bedlam is that its 90's-style controls are an entertaining novelty for a while, but soon begin to become annoying when the game dials up the difficulty level, and you have to storm rooms full of enemies. Unfortunately, shooting is very imprecise, and trying to line up the very stiff-feeling reticle to aim at speed is far more difficult than it should be, so you end up whiffing shots – while getting nailed by enemies. The targeting also seems to be very fussy, and sometimes I'd shoot something that I was sure I hit, but for some reason it wouldn't go down without me adjusting my sight by a pixel or two and shooting at it again. The collision boxes sometimes just didn't seem to match up with the graphics. This frustration is compounded by a checkpoint system that's fairly punishing – and can send you way back almost to the start of a level, even though you've very nearly reached its end. Perhaps this is a deliberate throwback to the difficulty of 90's games, but I didn't really appreciate it. As you progress deeper into Bedlam, you play through different genres and eras of gaming, which is a great concept for sure – but like I said at the start, it's just not very well executed. 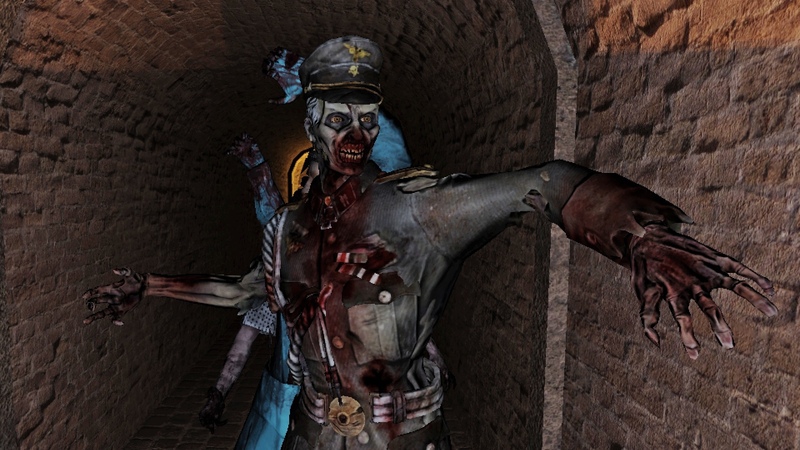 There's a 00's Medal of Honor-style set of levels, a Heretic-type RPG section, and a sci-fi FPS akin to Halo – as well as 3D minigame versions of Pac-Man and Space Invaders – but while the game is evolving and devolving around you, the controls are unfortunately not. 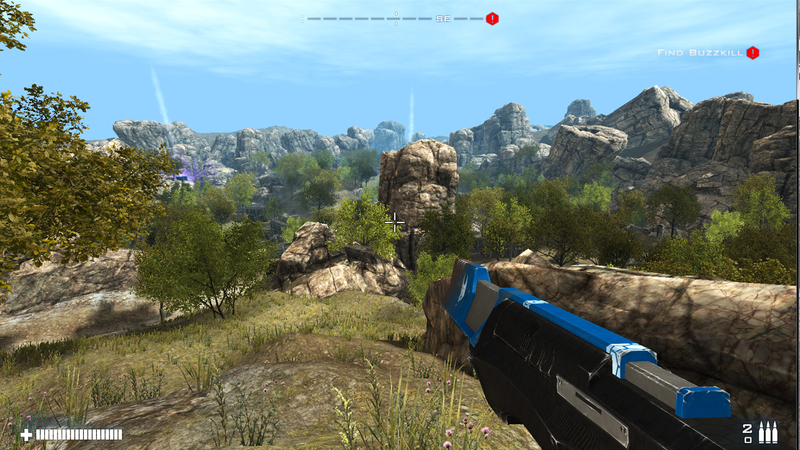 It's just different skins put on the same chassis, and that horrible, stiff-feeling shooting continues as a running theme throughout the game. It's such a shame, as Bedlam is a really great idea that actually has many of the pieces it requires to be brilliant. It manages to nail the graphic style of the different eras very well, and the dialog is consistently funny. Heather has a wide variety of comments and putdowns that are genuinely hilarious, and the banter between her and the various game denizens that she encounters is exceptionally well written and voiced. Unfortunately, though, its gameplay leaves a lot to be desired. The finicky aiming and shooting is a huge bugbear, and the punishing checkpoints, and awkward difficulty spikes just make the game frustrating. It seems like developer RedBedlam bit off more than it could chew, and couldn't quite tune the game to be fun. Indeed, I even encountered a few weird glitches, and there were numerous times when the framerate dropped in a very pronounced way. Ultimately, Bedlam feels like it needed more development time. It's a great idea, but unfortunately not one whose potential has been fully realized. Bedlam is a tough game, so there's plenty to challenge you. The problem is, though, it's just not much fun. Very well voiced, but the effects and music are fairly forgettable. Very good. The game nails the FPS periods it's copying, from Doom-style graphics through 00's WWII games to a more modern-looking sci-fi game. Bedlam's concept is absolutely brilliant, and it's voiced very well too. Unfortunately, its stiff, unforgiving gameplay just isn't much fun, and what you're left with is a great idea whose potential just hasn't been fully realized.